Enjoy these highlights from my interview with author Lisa Herndon (see podcast link below or on my iTunes page). 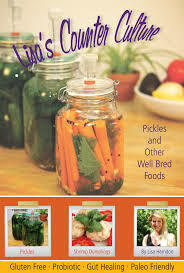 This is the second edition of “Lisa’s Counter Culture: Pickles and Other Well Bred Foods”. 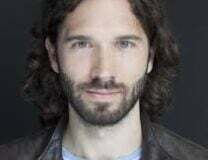 Lisa and I also spoke last year in this podcast interview on the first edition. The biggest change is the type of fermenting system recommended. The Probiotic Jar seems to be an improvement over the previous Pickl-It system, providing air-tight fermentation with nifty appendages for keeping food submerged, airtight, and free of noxious bacteria or mold. The best results come from achieving true ANAEROBIC fermentation. Anaerobic, meaning no oxygen to affect the quality of the ferment. It’s a magic chemistry that occurs, and results will be significantly improved if you follow the precise and easy steps Lisa lays out. This book will make you feel totally confident, with no lingering doubts about time, temperature, brine, starters, storage or preparation. Are you ready to be a fermenting superstar? First, understand the basics of what you’re doing. Anaerobic fermentation allows only good bacteria to survive and consume the sugars in the food and preserve it. You’re making vitamins and new probiotic bacteria as you go. 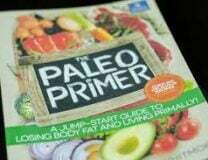 The resultant sauerkraut, chutney, fruit or kefir is more nutrient dense than the food you started with. Large quantities of probiotic bacteria will be produced, so start eating only small amounts as condiments. Many people have undesirable or pathogenic bacteria or yeast in their bodies. These will be crowded out by the beneficial probiotics/bacteria in properly prepared lactofermented foods, resulting in a die-off reaction. So start slowly and build as tolerated. Second, assemble the correct ingredients. Fruits and vegetables provide the bacteria and beneficial yeast to do the work in The Probiotic Jar. You don’t need starters such as whey or salt. This has always been an issue for me, as I am dairy intolerant for one, and could never get the salt ratios right, for the other. Since the fruits and veggies themselves are the first key, buy the highest quality, freshest food you can afford. Pesticides and herbicides are not helpful! The right kind of salt is more important than I knew. Sea salt can be too wet. Finely ground Himalayan is best. Invest in several Probiotic Jars with all the airlocks, gaskets and brine bowls that come with them. You can get extra jars, as the lids are interchangeable, allowing you to move your kraut or pickles to a smaller, more airtight jar as you eat them. Third, get the temperature, light and timing correct. This book gives exact details on time, light and temperature. Sauerkraut, for example, can take several months to process through the all-important 4th stage of fermentation! Fermentation for 30 days is the absolute minimum to get the complete cycle – but most people and companies ferment for only a few days or a week. Page 44 discusses The Stages of Lactofermentation. It’s a fascinating chart of what’s going on inside those jars! Finally, get busy creating your ferment. Some will be ready in a just few days so try easy ones first. In this podcast, Lisa suggests the Watermelon Salsa or the Dilled Carrot Sticks. In addition to loads of instructions that are perfectly edited and organized, there are 56 pages of recipes and another 60 pages of companion recipes such as Bone Broths, organ meats, salad dressings, seafood and more. 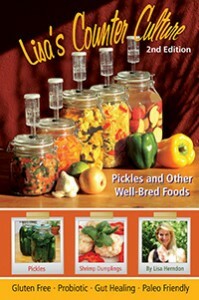 You can find the book and The Probiotic Jar on Lisa’s website, Lisa’s Counter Culture. She teaches classes on fermenting in Northern California and can answer your fermenting questions on her Facebook page too.